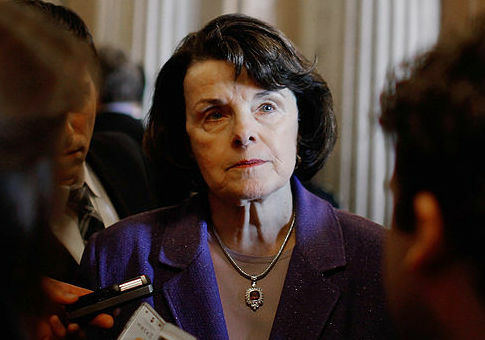 The Democratic Party's progressive wing and liberal journalists were quick to vocally oppose Sen. Dianne Feinstein's (D., Calif.) reelection bid for 2018 after she announced her decision to run on Monday. Feinstein's announcement came earlier than initially planned in order to get ahead of California State Senate Leader Kevin de León's entry into the race for her seat, according to a "wired" California Democrat who spoke to Jonathan Martin of the New York Times. At least one liberal journalist, Markos Moulitsas, founder of the progressive Daily Kos and co-founder of Vox Media, reached out directly to De León, an outspoken opponent of President Donald Trump who is pushing a sanctuary state law in California, offering to work together to beat "the most pro-Trump Blue-state Dem in the country [Feinstein]." Moulitsas was not the only left-leaning journalist to castigate Feinstein on Twitter shortly after she announced her 2018 Senate bid. Most elected Democrats are expected to support Feinstein, but at least one Democratic lawmaker from California has harshly denounced her. Rep. Ro Khanna, who represents Silicon Valley in Congress, told Jeff Stein of Vox that Feinstein "is out of touch with the grassroots of our party on economic policy and foreign policy." "After 47 years in elected office and 25 years in the Senate, she continues to cling to office as a voice for the status quo," Khanna continued. "The fact that the establishment is rallying around her reelection shows that D.C. insiders continued to privilege protecting one of their own over the voters concerns [sic]." "How many times will voters have to demand change before we listen?" he added. Khanna later told Politico‘s Carla Marinucci that he is urging Democratic Rep. Barbara Lee (Calif.) and University of California, Berkeley professor Robert Reich to challenge Feinstein in the Democratic primary. The Justice Democrats, a political action committee inspired by Sen. Bernie Sanders (I., Vt.) with leadership from his 2016 presidential campaign, has vowed to back a primary challenger to oppose Feinstein. "Her policies are completely out of touch with California Democrats, and we think she'd be more at home in a Republican primary," said Corbin Trent, a member of the group. "Safe Democratic seats are the place we should be representing core Democratic values." Feinstein has faced criticism in progressive circles for refusing to call for Trump's impeachment and for hoping that "he can be a good president" at a San Francisco event in August. Beyond opposition from the left in the media and with some holding office, Feinstein may face problems with California voters. Fewer than half of Californians say they want Feinstein to run for reelection, according to a poll released by the Public Policy Institute of California in September. The survey found that just 41 percent of adults say she should run for a sixth term and that only 43 percent of likely voters believe the senator should seek another term. Still, Feinstein is expected to have the support of most establishment Democrats already in office, and she already has the endorsement of her fellow California Democrat in the Senate. The rising liberal star Sen. Kamala Harris tweeted her support for the 84-year-old Feinstein shortly after her reelection announcement. UPDATED 4:01 P.M.: This post was updated to include Marinucci's tweet on Khanna urging people to challenge Feinstein in the Democratic primary. This entry was posted in Politics and tagged California, Democratic Party, Dianne Feinstein, Glenn Greenwald, Kamala Harris, Senate Democrats. Bookmark the permalink.